Add Sizzle to Summer Gardens | Faddegon's Nursery, Inc. The lazy, hazy days of late summer are perfect for lolly-gaggling around the pool and enjoying barbeques in the backyard. All the more reason that our gardens show be dazzling backdrops. But many gardeners throw up trowels in frustration as they stare at peaked gardens with lackluster blooms. Thankfully, you can easily reverse this scenario by adding these sizzling late bloomers. Let’s start with some great perennials for sun to part sun. Russian Sage (Perovskia) has silvery stems and leaves with fragrant lavender blooms. Atriplicifolia is most commonly sold at garden centers and grows to 3’ to 4’ feet. ‘Little Spire’ is a compact version only reaching 25”. Both are hardy to Zone 4. ‘Chicago Apache’ daylily (30” tall) is famous for its late summer show. Huge 5” red flowers cover the plant starting in late July and continuing through August. Helen’s Flower (Helenium) is a terrific cut flower and no-fuss showboat. Available in deep red, yellow, and rusty-orange and yellow, it blazes the way into autumn. Pink Turtlehead (Chelone) (pictured) has pink or white flowers that decorate rich green, glossy leaves starting in August. 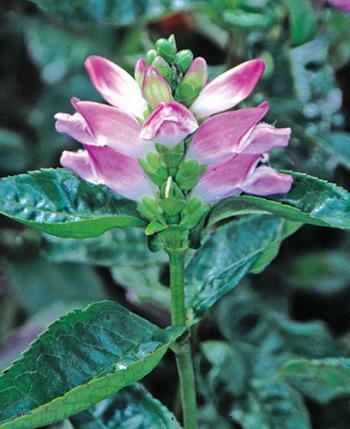 Turtlehead can handle sun or shade as well as drier conditions,despite its fame as being a moisture lover. The species, lyonii, has pink flowers and gets 3’+ while ‘Hot Lips’ has deep pink flowers and stays shorter at 2’ to 3’. All Turtleheads have stiff stems that can be pinched in early June for compact, heavier blooming plants. 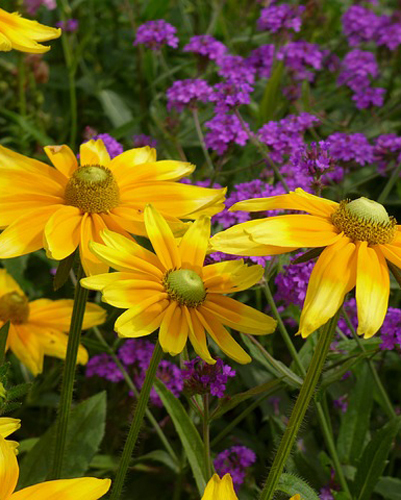 ‘Chicago Apache’, Helenium and Chelone are all hardy to Zone 3. Fleeceflower ‘Firetail’ (Persicaria) has striking red, spiky flowers opening in July and persevering into November. And that’s without deadheading! It’s also a butterfly and honeybee magnet. A marvelous pick for Zones 4 and warmer. Stepping into the shade, Toad Lily (Tricyrtis), a member of the orchid family, has a graceful, arching habit with white, yellow, or lavender-pink flowers that start opening in August. Many times the flowers are heavily spotted. Toad Lilies are hardy to Zone 4 and heights range from 2’ to 3’. Yellow Waxbells (Kirengeshoma) have buttery-yellow, dangling blooms. The foliage looks very similar to maple leaves. They have a shrub-like appearance and check-in at 3’to 4’ tall. Yellow Waxbells are hardy to Zone 4. Eupatorium ‘Chocolate’ sends forth airy white flowers over dark foliage in September and October. Even though the plant tag states it needs full to part sun, mine have bloomed enthusiastically in dappled shade. This ‘delicious’ plant gets 3’ to 4’ tall and is hardy to zone 4. Cimicifuga ‘Brunette’ and ‘Hillside Black Beauty’ (pictured) have creamy-white, candle-like flowers that are incredibly fragrant. Needing plenty of space, these 3’ wide and 5’ tall specimens command center stage when in bloom. 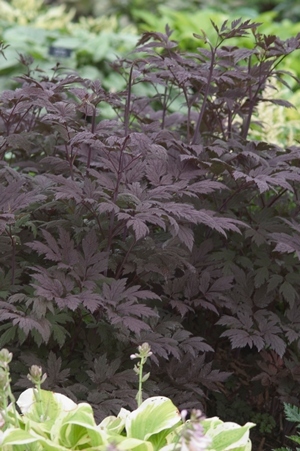 They do best in part shade or part sun and are hardy to Zone 4. A bonus is they’re also are snubbed by deer and rabbits. Lastly, the 2009 perennial of the year, Japanese Forest Grass (Hakonechloa m. ‘Aureola’) thrives in shade with rich, cascading gold and green blades that will give any flower a run for its money. A neat, clump-forming grass, it only gets between 1’-2’ tall and is hardy to Zone 5 (but from my experience, it does fine is Zone 4). So no more excuses for ho-hum, late summer gardens. These blah-busters will turn up the heat and break out the applause.